This week we're letting everyone know just what we're thankful for. And that includes... YOU! There's a new giveaway at every single stop so be sure to hop around and visit your favorite blogs and find a few new ones to follow too! 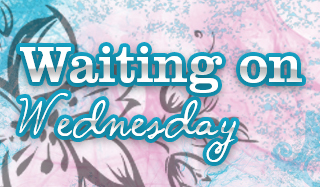 I had to sign up for this blog hop when I saw it. I'm really thankful for everyone that I've met over the past few years though blogging. I've met some awesome readers, bloggers, and authors and wouldn't trade the experience for anything. I started the blog because I love books and wanted to share my love of books with everyone. So far it's been fun and I plan on doing it for years to come. Prize: I'll be giving away one $10 Amazon gift card to one lucky winner! INT winner may select a book of their choice that is $10 or under from The Book Depository if it has free shipping to their country. You can check HERE. Rules: The giveaway ends on November 27th at 11:59 PM. I will contact the winner via email on November 28th, they will have 48 hours from my email to claim their prize or another winner will be chosen. All fake entries will be deleted. I'm just doing one daily entry per person, you can come back daily and get another entry. If you want to follow/share/etc feel free to, but you don't have to. 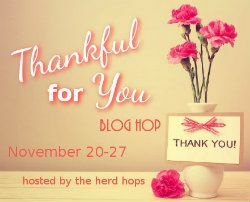 Don't forget to check out the other bloggers participating in the hop! Happy Thanksgiving! I'm grateful to bloggers and reviewers such as yourself. Thank you for all you do. <333 you're sweet, hope you and your family have a happy Thanksgiving! Happy Thanksgiving! Thank you for the giveaway chance! I hope that you have a wonderful holiday! Thank you for the great giveaway and hop. No problem, Esther. Good luck!